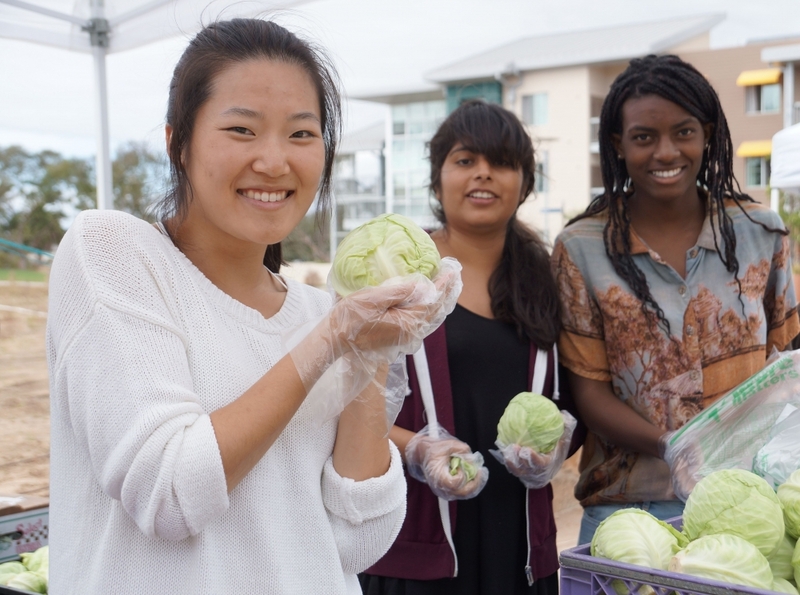 The UCSB Associated Students Food Bank recently partnered on Produce First!, an outreach event meant to educate students about food security, nutrition and more. The Associated Students Food Bank at UCSB has serviced more than 6,000 students since launching in 2011. 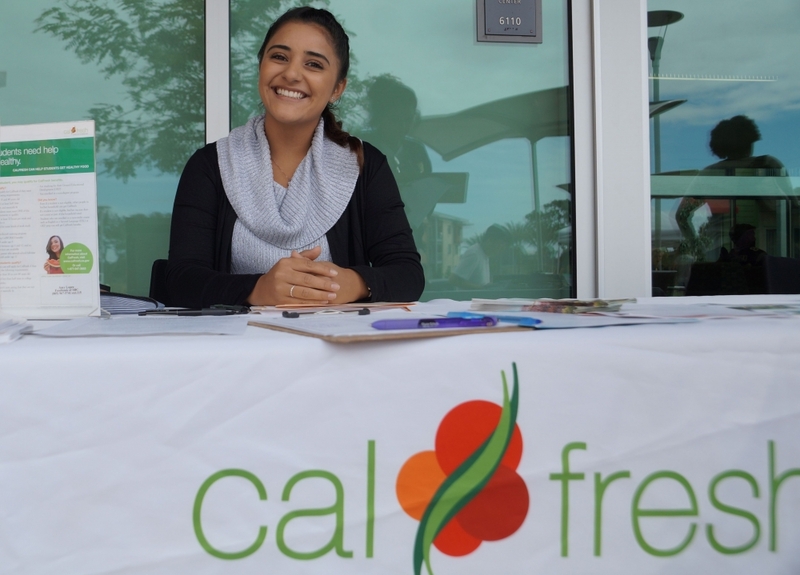 UCSB undergraduate Marilyn Becerra is the lead CalFresh advocate for the Food Bank of Santa Barbara County, working to educate and enroll eligible fellow students for the benefit. Passionate about food security, UCSB aquatic biology major Marilyn Becerra is active in CalFresh outreach and education efforts on campus and in the community. Chef Mickael Blancho of UCSB’s University Center Dining Services, better known as the UCSB Soup Guy, gives a cooking demonstration for the new Food, Nutrition and Basic Skills Program. Growing up, Marilyn Becerra never had to worry about having enough to eat. And then one day she did. Things changed overnight when Becerra’s father was diagnosed with cancer. Mounting bills left the family budget tighter, and suddenly the UC Santa Barbara student and aspiring doctor faced another challenge: food insecurity. 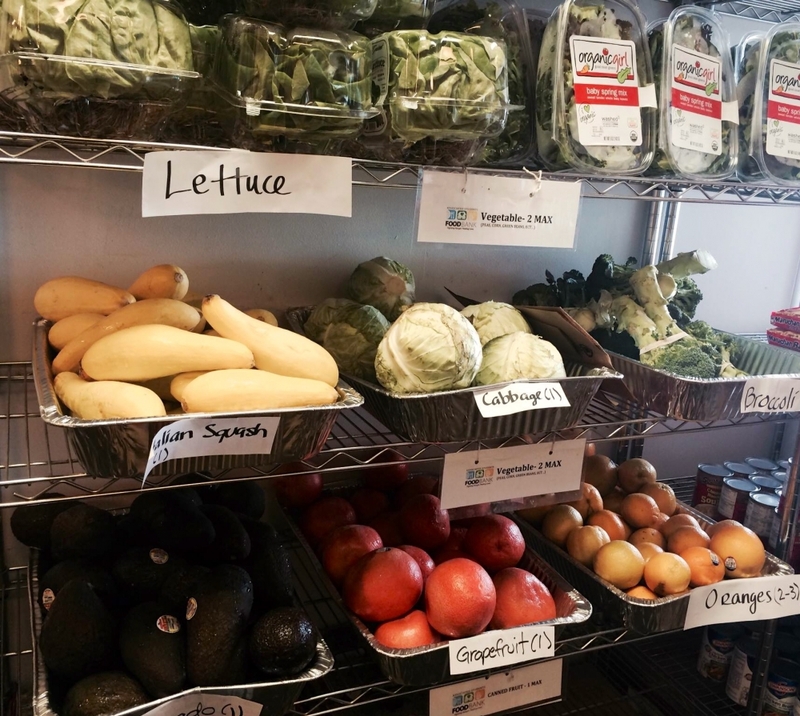 What Becerra found was UCSB’s Associated Students Food Bank and, with its help, CalFresh, a state program that offers a monthly food benefit to qualifying students. She also found a new passion. Becerra’s own experience with food insecurity has driven her to help others struggling with the same issue. Now working for the Foodbank of Santa Barbara County as the lead CalFresh advocate at UCSB, she is integral to campus outreach efforts, educating students about the benefit and, for those who are eligible, helping them apply. The recent UC Global Food Initiative Student Food Access and Security study found that 42 percent of respondents systemwide reported having either low (23 percent) or very low (19 percent) food security. The UCSB-specific results were nearly identical, with 24 percent of student respondents reporting low food security, and 17 percent very low. To help reduce those numbers and improve food security across all its campuses, the UC Office of the President, as part of the ongoing and increasingly robust UC Global Food Initiative (GFI), has allocated $3.3 million to assist all UCs in such endeavors. Of the total, UCSB will receive $151,000. Among UCSB’s priorities for those funds is a bigger push to enroll students in CalFresh — a rare undertaking among universities — and hiring other students to help make it happen. It’s just one way that UCSB is again, and still, leading the charge on matters of food security, access to nutritious food and food justice. “We were the first campus in the UC to really dive into CalFresh and maximize the benefit for students, and get as many students in the pipeline as possible,” said Mike Miller, UCSB’s interim assistant vice chancellor of enrollment services and director of financial aid, who also is chair of the campus’s Food Security Task Force. “Faculty, staff and students have taken a holistic approach that is not being done anywhere else to this degree. UCSB is definitely at the forefront of the overall food security issue. UCSB was the first campus in the UC system with a full-time staff member at its food pantry. Since launching in 2011, the AS Food Bank has serviced more than 6,000 students and grown to encompass other efforts, including CalFresh assistance and Swipes for Us, a meal-ticket donation program with residential dining. 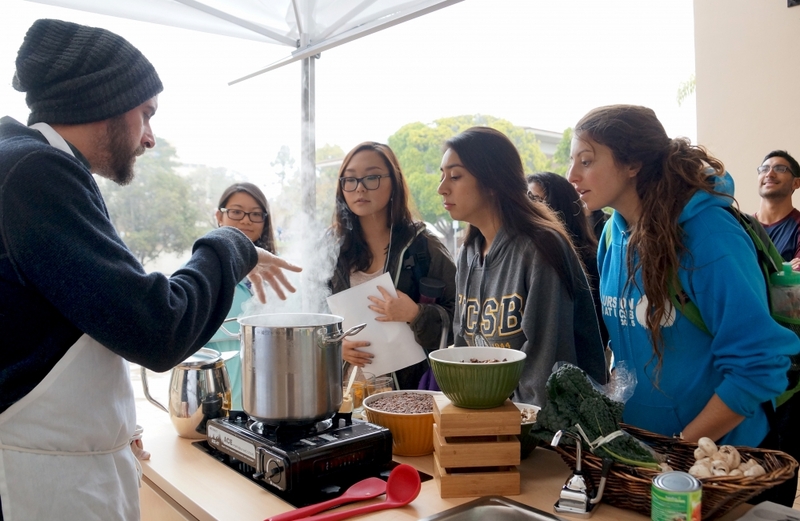 The Edible Campus Program — launched in 2015 as a collaboration of the AS Food Bank, the composting-gardening group AS Department of Public Worms and UCSB Sustainability — grows food on campus to donate to the AS Food Bank. The Gaucho Certified Farmers’ Market offers fresh produce options from local farmers each week. And, thanks to the new GFI funding, UCSB will expand its still-young but already popular Food, Nutrition and Basic Skills Program. The 2016-born endeavor aims to provide students with foundational skills to successfully live on their own by way of workshops in budgeting and meal planning, basic kitchen skills, cooking and nutrition, as well as insight into food as a crucial piece of the sustainability puzzle. On top of the many campus partners in that program — including the AS Food Bank, University Center Dining, Housing & Residential Dining and others — is the Isla Vista Food Co-op. Believing that even one hungry student is too many, UCSB early on determined that engaging the broader community would be key to its success. The local employee-owned grocer has since become a critical collaborator with the campus on that effort, CalFresh and on all things food. “After over 10 years of my life learning how to run a grocery store, I know what can be possible if the right groups of people with the right values are able to collaborate on a high level within our producer-to-retailer-to-consumer food system,” said Melissa Cohen, general manager of the IV Food Co-op and a UCSB alumna. “From where I have the immense privilege to sit everyday, I see that there are ways to co-create solutions that are feasible and replicable far beyond Isla Vista and UCSB, simply because we are bearing witness to it every day.